If you know me, you know I will try just about any health and wellness product at least ONCE. “Wellness” trends have been exploding recently and it is somewhat overwhelming (thank YOU Instagram haha). 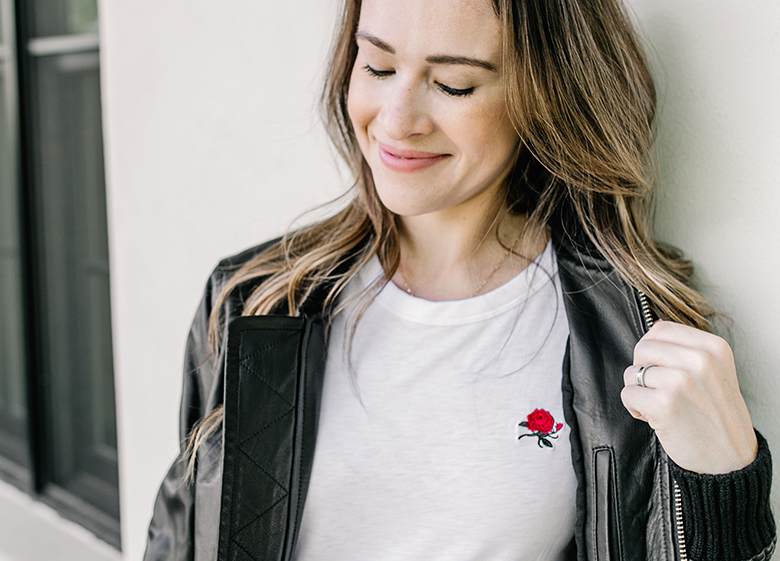 Have you ever thought, okay if I were to do ALL the things these blog posts and companies tell me that “I need to do” I wouldn’t have a job or a friends, and would be a very “well” and “healthy” hermit – haha! There are practices that have been around for centuries like meditation, acupuncture, and yoga that I absolutely love. Meditating every morning for 10 minutes on my Headspace app has become one of the best parts of my morning routine. Focusing on my mental clarity and being aware of what I put into my body has been incredibly rewarding. But honestly, we are busy busy people and while we do need to take time for some self-care, we have to be realistic about what we spend our time on. When it comes to wellness products, the MOST important thing is finding what benefits you value most and spending time on those things. These products might not align with your concerns, so take everything with a grain of salt. Out of all the products I have tried, these are the ones that I have noticed truly make a difference for me and my body. Now before you think, how in the world could that be comfortable… hear me out. This mat is a natural way to calm your muscles from back pain, neck pain, stress, insomnia and overall joint pain. 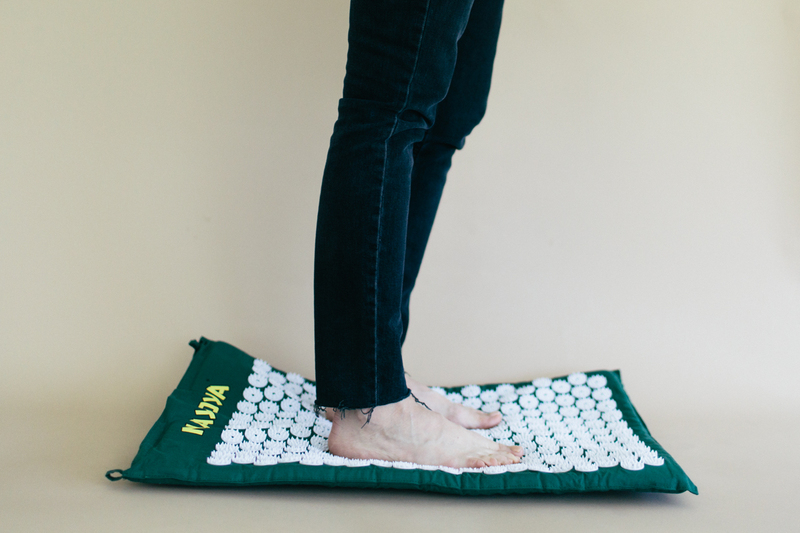 Acupressure has been a part of traditional Chinese medicine for over 2,000 years and this mat is simply a modernized at-home tool using the exact same principles. Acupressure revolves around using deep firm pressure to stimulate points of the body that trigger natural pathways of our nervous system called meridians and start blood flow circulation. Yes, this so called “bed of nails” is a foam mat with thousand of sharp plastic needles. But when you sit, lie, or stand on the needles it sends a sense of relaxation throughout your muscles. It is slightly uncomfortable in the first minute then your body starts to release endorphins and feel relaxed. Another plus is that acupressure mats are incredibly inexpensive (I use this one and it comes with a pillow), you can’t over use it, the needles won’t harm your skin and they are easy to wash if needed. I’m not sure why but for me, standing on it with my feet has the most relaxing effect for me. Basically, if you need to chill out and relax try a $30 acupressure mat because I can’t live without mine. You’ve heard this from your skincare brands, your dermatologist, and back in that high school biology class right? Well it’s true, and as rushed as we often feel in the morning this 3 minute step before getting into the shower could be one of the best thing you do for your body in the morning. 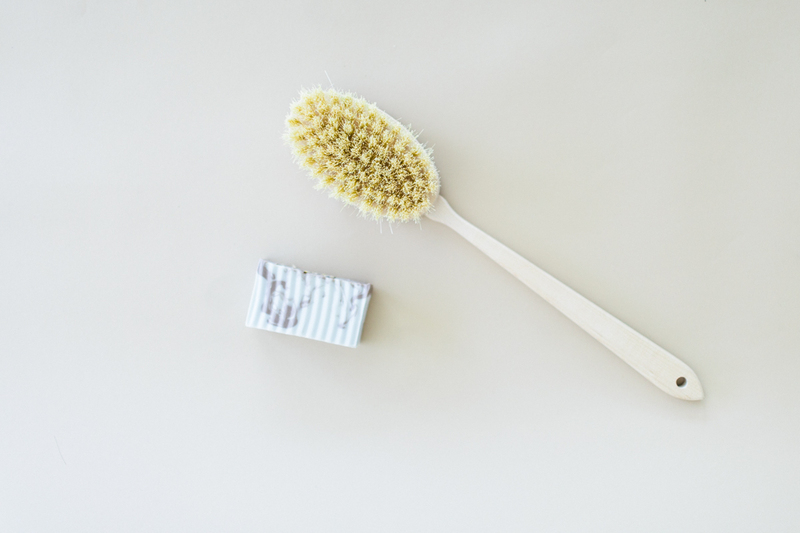 It’s basically just how it sounds you are using a brushing your skin with a dry bristled brush. BUT there is a certain motion to do it in. Use a body brush starting at your feet and brush upward in a long stroke, always towards your heart. Once you reach your stomach gently brush in a counterclockwise motion. Be very very gentle on your chest area or avoid it entirely. On your arms, brush up from your hands to your shoulders and I always try to reach my upper back. 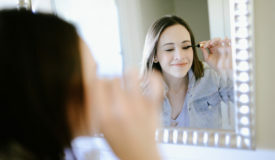 So now that you know what it is and how it’s done let’s talk about WHY it could be the most beneficial part of your routine. Besides these physical benefits, when working in motion towards your hear and stimulating your lymphatic system it WAKES YOU UP. It’s like a cold shower and send a tingling sensation of energy in your body. Uber successful people like Tony Robbins and Tim Ferris (read here) or even celebrities like Gwenyth Paltrow and Miranda Kerr swear by it in their morning routine. The physical long-term benefits come with consistency of doing it every day but even doing it every now and then is quick and incredibly beneficial. Not the most glamorous of the bunch, but one backed by science and used by athletes and physical therapists for years that is recently becoming much more of a household item: the foam roller. 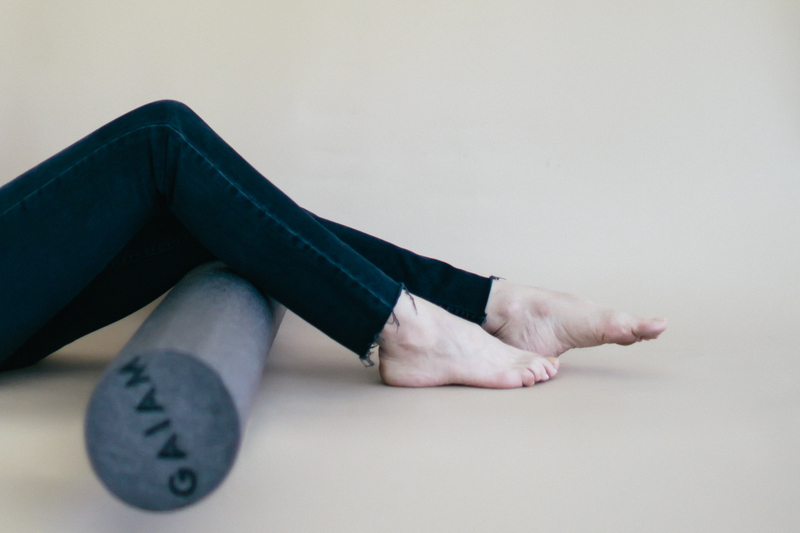 In it’s most technical term foam rolling is “self-myofascial release” describes foam rolling’s self-massage use to breakdown the tightness and sore pain in our muscles by massaging the fascia- a connective tissue that binds our muscles. This is why it’s known to help with range of motion, flexibility, and blood circulation. If you are sore, this is NOT relaxing and does feel slightly painful. But if you push through and massage gently back and forth over the area for 90 seconds, you do feel less sore. When we’re sore we want our blood to circulate and muscle to warm up to it can be exercised safely. That’s why I use it even if I’m not sore, but just to warm up my muscles and stretch them to prevent future injury. Foam rollers are also very cheap (find mine here) and is something you can do while watching TV, before bed, or like me while Diego sleeps! 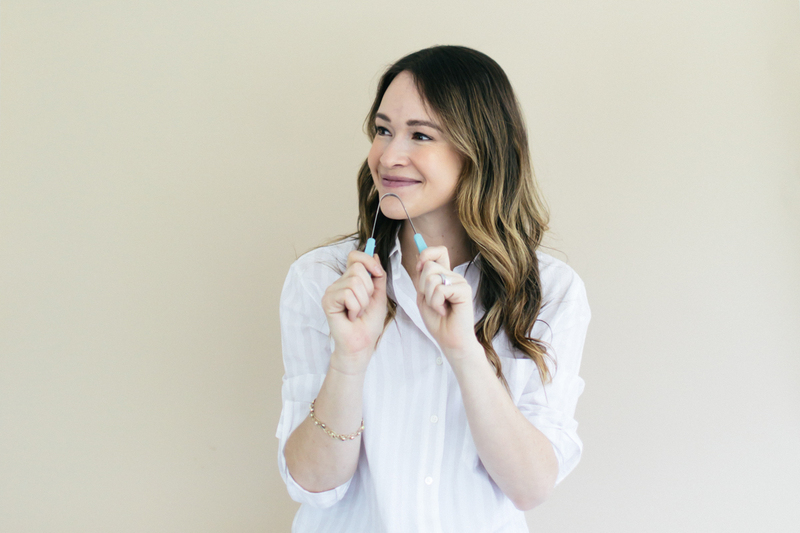 Tongue scraping is an ancient Ayurvedic practice where a stainless steel, gold or copper U-shaped tool is used quite literally scrape your tongue removing bacteria, awakening your digestive system and ridding toxins before they enter your body. The oral hygiene benefits showed in dental research are what really intrigued me. Improved breath, bacteria removal, and cleansed taste buds. We often get what’s called “tongue coating”, you know that whiteish layer we have on our tongue from all the things we eat and drink? Yeah GROSS. But it happens, that’s why I tongue scrape and remove that layer for not only removal of bacteria but removing that tongue coating allows our taste buds to experience flavors. Also, no one likes bad breath and a coated tongue is a cause of bad breath. Simple. As soon as I wake up before eating, drinking or brushing my teeth I use my tongue scraper and scrape from the far back of my tongue to the front in one long stroke 5-10 times, washing the tongue scraper in between each scrape. Where to Get a Tongue Scraper? A lot of drugstores sell tongue scrapers, but I think it’s important to get a good stainless steel or copper one if you are going to be putting it in your mouth constantly, so here are some I recommend! There are so many vitamins and nutrients we can get in our food from eating healthy, BUT we can’t eat every single nutrient or we’d be eating all day long. 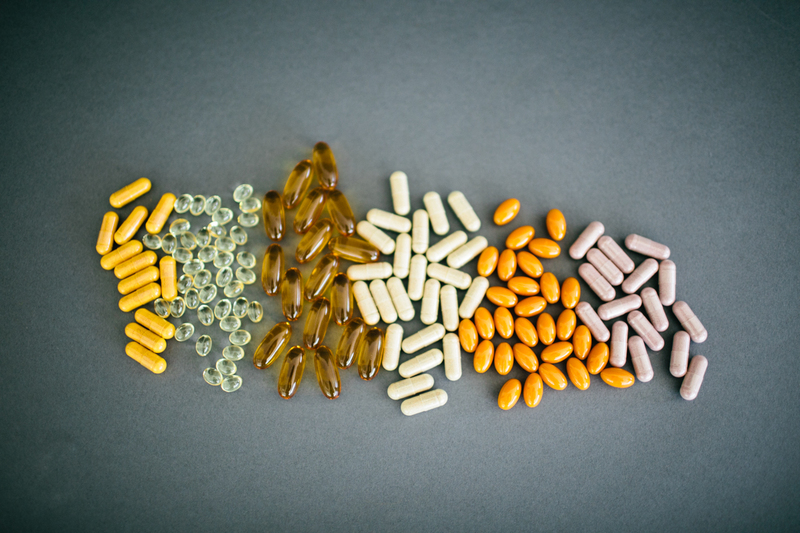 Vitamins and supplements make it easier, but they can also be overwhelming. There is a vitamin for EVERYTHING. When was the last time you didn’t feel overwhelmed walking down the vitamin aisle? So that’s why I wanted to share just the supplements I take everyday and that have made me feel my best. It might seem like a long list, but I keep them all in one drawer and it’s just become a part of my routine after breakfast to take my supplements. For a little background, I have a hyper active thyroid, MTHFR (read more about it here), and a few food intolerances so I take some for the goal of combatting those symptoms or things I am naturally lacking. All brands I take are linked! These are definitely my favorite products and wellness tips that I can share with anyone. Please let me know if you try out any or have one YOU swear by that I didn’t put on my list. 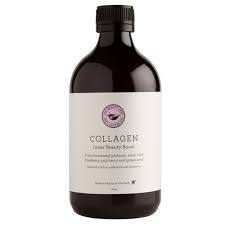 As always, I will try just about any health & wellness product once so I love sharing new products I find with you guys and hearing what you love! Before you go, be sure to keep up with me on Instagram and Pinterest!